NIC is short for network interface card. 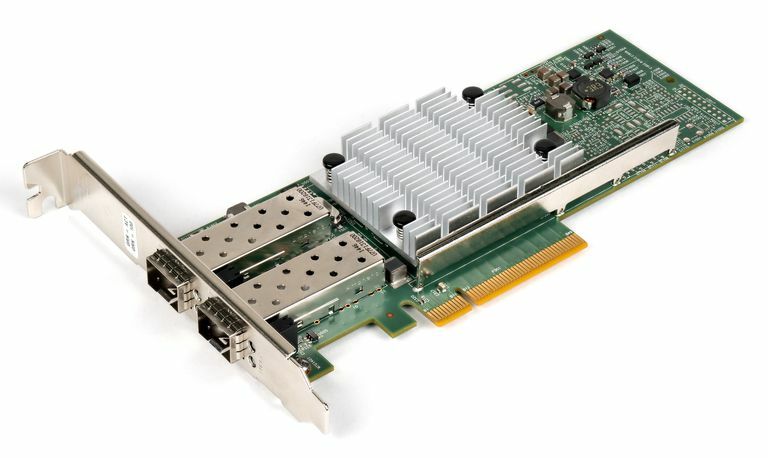 It's network adapter hardware in the form of an add-in card that fits in an expansion slot on a computer's motherboard. Most computers have them built-in (in which case they're just a part of the circuit board) but you can also add your own NIC to expand the functionality of the system. The NIC is what provides the hardware interface between a computer and a network. This is true whether the network is wired or wireless since the NIC can be used for Ethernet networks as well as Wi-Fi ones, as well as whether it's a desktop or laptop. "Network cards" that connect over USB are not actually cards but instead regular USB devices that enable network connections through the USB port. These are called network adapters. NIC also stands for Network Information Center. For example, the organization InterNIC is a NIC that provides information to the general public on internet domain names. What Does a NIC Do? Put simply, a network interface card enables a device to network with other devices. This is true whether the devices are connected to a central network (like in infrastructure mode) or even if they're paired together, directly from one device to the other (i.e. ad-hoc mode). However, a NIC isn't always the only component needed to interface with other devices. For example, if the device is part of a larger network and you want it to have access to the internet, like at home or in a business, a router is required too. The device, then, uses the network interface card to connect to the router, which is connected to the internet. Network cards come in many different forms but the two main ones are wired and wireless. Wireless NICs need to use wireless technologies to access the network, so they have one or more antennas sticking out of the card. You can see an example of this with the TP-Link PCI Express Adapter. Wired NICs just use an RJ45 port since they have an Ethernet cable attached to the end. This makes them much flatter than wireless network cards. The TP-Link Gigabit Ethernet PCI Express Network Adapter is one example. No matter which is used, the NIC protrudes from the back of the computer next to the other plugs, like for the monitor. If the NIC is plugged into a laptop, it's most likely attached to the side. How Fast Are Network Cards? All NICs feature a speed rating, such as 11 Mbps, 54 Mbps or 100 Mbps, that suggest the general performance of the unit. You can find this information in Windows by right-clicking the network connection from the Network and Sharing Center > Change adapter settings section of Control Panel. It's important to keep in mind that the speed of the NIC does not necessarily determine the speed of the internet connection. This is due to reasons like available bandwidth and the speed you're paying for. For example, if you're only paying for 20 Mbps download speeds, using a 100 Mbps NIC will not increase your speeds to 100 Mbps, or even to anything over 20 Mbps. However, if you're paying for 20 Mbps but your NIC only supports 11 Mbps, you will suffer from slower download speeds since the installed hardware can only work as fast as it's rated to work. In other words, the speed of the network, when just these two factors are considered, is determined by the slower of the two. Another major player in network speeds is bandwidth. If you're supposed to be getting 100 Mbps and your card supports it, but you have three computers on the network that are downloading simultaneously, that 100 Mbps will be split in three, which will really only serve each client around 33 Mbps. There are many places where you can buy NICs, both in stores and online. Some online retailers include Amazon and Newegg, but physical stores like Walmart sell network cards too. All hardware devices need device drivers in order to work with the software on the computer. If your network card isn't working, it's likely that the driver is missing, corrupted or outdated. Updating network card drivers can be tricky since you usually need the internet in order to download the driver, but the driver issue is precisely what's preventing you from accessing the internet! In these cases, you should download the network driver on a computer that works and then transfer it to the problem system with a flash drive or CD. The easiest way to do this is to use a driver updater tool that can scan for updates even when the computer is offline. Run the program on the PC that needs the driver and then save the information to a file. Open the file in the same driver updater program on a working computer, download the drivers and then transfer them to the non-working computer to update the drivers there.